March 2017 Member of the Month: David Johnson!! It’s time to celebrate our March Member of the Month, the 6am super strong fella, David Johnson. David came to the gym after his equally strong and determined daughter started CrossFit. Learn all about David below including his secret/exclusive non-Seahawks club. What made you come walking through the doors at CFWS? My 16-year old daughter told me she wanted to try CrossFit last summer for off-season conditioning between her rowing seasons. I had noticed CFWS when making grocery runs to the Admiral Safeway so we dropped in one day to check it out. After a fantastic welcome and introduction to CFWS by Janice, I decided to try it out, too! I ran my first two half marathons last year and really wanted to expand my health and fitness beyond endurance running. How long have you been a member? Only 5 months! I joined full time in October 2016. What’s special about CFWS? And what keeps you coming in day after day? While I love the fitness gains I’ve made in such a short time, Without a doubt it is the people who keep me coming back! The energy, motivation and friendship I feel when working on the daily strength/skill or tackling the WOD with other CFWS members has really locked CrossFit into my life. When you show up for the daily WOD, your fingers are crossed that it will include? Rowing — I love the racing feel of being on an erg machine. Won’t include? Squats. My biggest challenge, but I’ve stopped avoiding them and am trying to get better. What music gives you extra fire during a workout? Rock music, especially with a harder edge (Metallica, Tool, Disturbed, Rage…), really gets me pumped up during a WOD. Coach Oz regularly gets the nod for best workout soundtrack! If you can have any super power, what would it be? Omnilingualism. The ability to communicate verbally and non-verbally with anyone, anywhere, without having to study that language and culture for years would be an amazing power to have. Advice you would give to a new member just starting their CrossFit journey? Don’t be intimidated by the amazing athletes who have been working at this for years and don’t judge your progress based on someone else’s goals and abilities. Just keep showing up and do the best you can. Be open to coaching and offers of help from other members — those offers come from a genuine desire of fellow members to make things easier. Talk to people and get to know them — there are some pretty cool and amazing people doing CrossFit! A fun fact most at the gym don’t know about you? – I retired from the Navy in 2011 after 20 years flying on Maritime Patrol and Reconnaissance aircraft. Thanks to the Navy, I had the tremendous opportunity to live in and fly from some pretty cool, exotic places (some just really hot and sandy) on every continent except Antarctica! 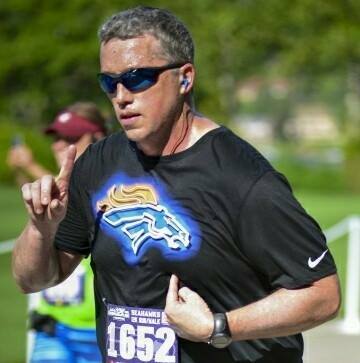 – After I moved to Seattle, I founded the “Denver Broncos Fans of Seattle” supporters group. DBFS has since become one of the largest such fan groups outside of my home state of Colorado with over 1,000 members connected on social media and several dedicated bars around the Puget Sound! I’m not strictly a Denver sports fan, though. During soccer season you’ll find me at every home Sounders match as a season ticket holder making a lot of noise with the Emerald City Supporters.